Heating and cooling account for almost half of a typical home's total energy expenses. When wintertime is fast approaching, it's a good idea to check in on your heating system and ensure it's in working order. If your heating system is in need of repairs, call in a professional sooner rather than later. If you're looking to install a totally new heating system for increased home comfort and affordability, there are many kinds of heating systems to choose from. Dr. Energy Saver can evaluate your system and suggest ways it can be improved for better performance and energy savings. We understand that some heating systems are better suited for certain climates than others, for example, so we can help you make informed choices for your home. No matter what kind of heating system you currently have and what repairs or replacements you need, Dr. Energy Saver will evaluate your system. Contact your local Dr. Energy Saver dealer for an estimate or home energy audit today! Furnaces: A very popular type of heating system, furnaces use warm air to heat your home, distributed by a ductwork system. Furnaces can run on many kinds of fuel, including propane, electricity, oil, and gas. Boilers: Boilers distribute hot water to heat your home. You can also invest in a combi-boiler if you're looking for a solution for your home's heat and hot water needs. 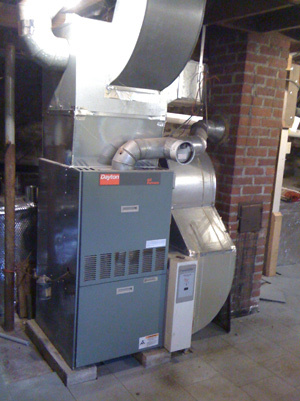 Boilers can run on many of the same fuels as furnaces, but do not use ductwork. Geothermal or ground-source heat pumps: Geothermal heat pumps rely on the earth's ground energy to either dump its heat in the summer or pick it up in the winter, bringing the right kind of air to your home. Because the earth's temperature remains about the same (55-65 degrees Fahrenheit) 6-12 feet below the surface, this type of heat pump performs efficiently in all climates. Hybrid HVAC systems: By combining an air source heat pump with a fossil fuel furnace, a hybrid HVAC system gives you the flexibility to use the most cost effective fuel at any given time or temperature. In addition, you get built-in redundancy so that if one system isn't working correctly, the other can take over. Controls are automated so there's nothing for you to do once you have programmed the thermostat, besides the enjoyment of unmatched comfort and energy savings. Solar heating: Make use of the sun's energy to supply a portion of your home's heating needs. With both active and passive solar heating options that collect and distribute heat in different ways, you can discover the system that makes the most of the solar energy available to you. Electric: Many types of systems, including radiant heaters and heat pumps, use electricity to power their heating needs. With so many heating options available, it's important to talk to the professionals at Dr. Energy Saver to make sure your heating is optimized for your home. Contact your local dealer today and schedule a home energy audit! We'll help you repair your existing unit or install a heating system that will keep you warm and save you money for years to come.